Following on from last night's sophisticated but essentially conventional genre piece, SILVER LININGS PLAYBOOK, today we have another unusually intelligent but ultimately banal rom-com - CELESTE & JESSE FOREVER. Both movies are a cut above the norm, with an emotional insight and verbal with that is rare, but I can't really see what they're doing in a Film Festival that's supposed to be spotlighting pioneering and unconventional film-making. Anyways, enough of that grouchiness and back to the movie. 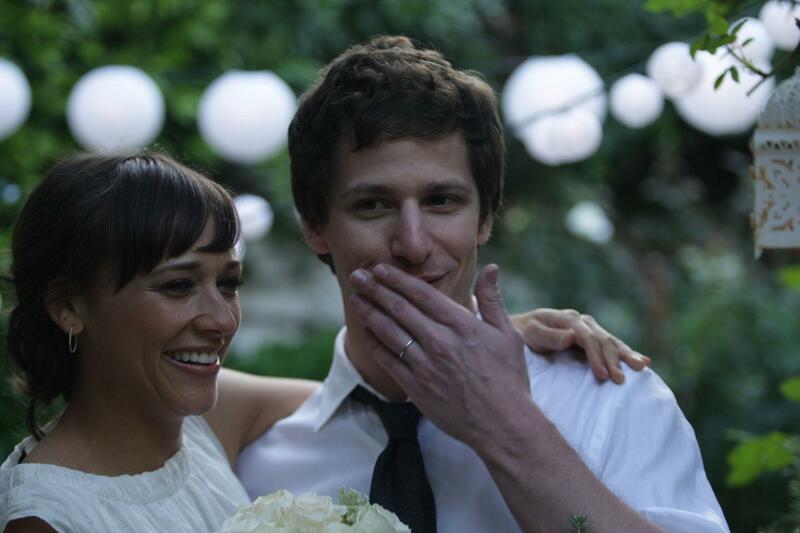 Rashida Jones (PARKS & RECREATION) and Andy Samberg (SNL) play Celeste and Jesse, two charming people who have remained best friends through their divorce. This unhealthily amicable mock separation is kicked up a gear when Jesse unexpectedly knocks up a one-night stand, and decides to make a go of it, forcing Celeste to confront the fact that she is really alone. A lot of the framework of the movie is clichéd. Jesse is the typical Apatow-esque manchild of the Seth Rogen or Jason Segel variety, and Celeste is the typical uptight career woman. Indeed, one could see this movie as an attempt to replay KNOCKED UP or FORGETTING SARAH MARSHALL from the perspective of the ambitious girlfriend that the schlubby manchild tries to forget. Accordingly, the narrative journey involves the protagonist maturing and accepting that life goes on. But instead of the manchild growing up, it's the woman who has to grow less controlling and judgemental. I really appreciated a lot of what the film was trying to do. It was refreshing to see the rom-com so firmly anchored on a female protagonist and, what's more, a woman who seemed real in her fears, frustrations and actions. Kudos to Rashida Jones for co-writing the script and bringing a new perspective, as well as strong comedic timing, to film. The problem is that although Jones and co-writer Will McCormack are trying to break the mould, too often the movie slips back into hackneyed set-ups and scenes. A classic example is the inappropriately revealing but endearing wedding speech by the best man, or in this case, maid of honour. The character of the popstar Riley, and the way in which her love-life is casually "fixed" is another case in point. So a lot to like here, and some frustrations. CELESTE & JESSE FOREVER is an entertaining watch, but I doubt I'll remember it in a week's time. CELESTE & JESSE FOREVER played Sundance and London 2012. It was released earlier this year in the USA, Taiwan and Singapore. It opens in Argentina on December 6th and in Germany on February 14th 2013.